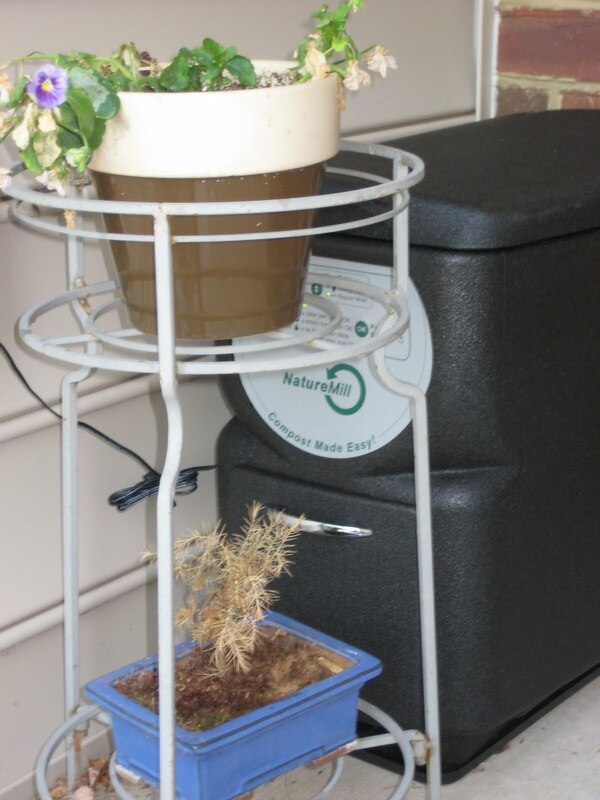 I have been coveting the Nature Mill composters since I heard about them a few years ago. I was given the opportunity to purchase one at a very generous discount, but still didn’t think I could fit it into my budget. Luckily for me, I think my husband felt guilty that I would be at home on my birthday, eating grilled cheese with my kids, while he was in Italy (on business.) So, he told me to go ahead and order it as my birthday gift! Initially, I was a little disappointed by how simple it seemed. The model I purchased retails for $299. Their specifications indicate that it is made of recycled + recyclable energy-efficient polypropylene (stamped with the “5” triangle recycling symbol.) 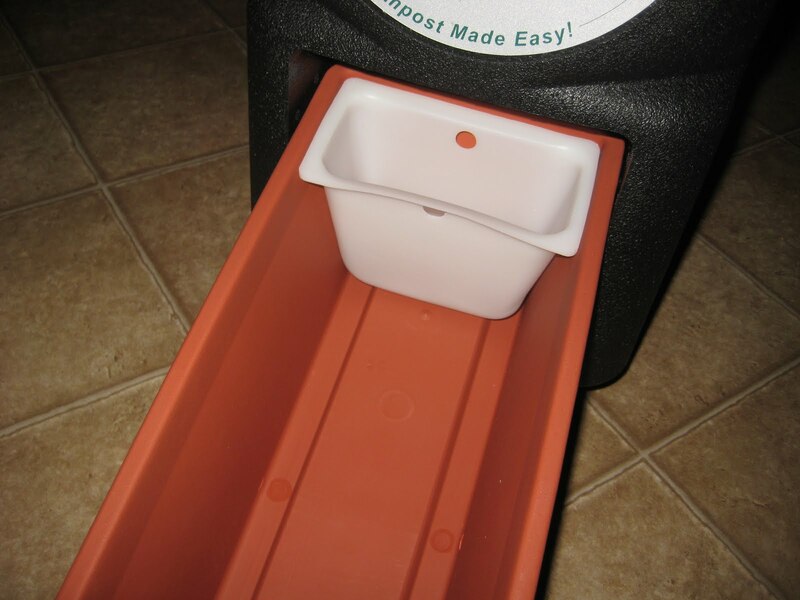 It has the appearance of heavy duty Styrofoam, and the overall composter just seems so simple that I felt like I had wasted my money, that there was no way I was really going to feel like this thing was worth it. I was wrong by the way. Perfect example of why I don’t write reviews immediately after I’ve received a product! The composter comes with sawdust pellets and baking soda that you add 1 cup/1 tablespoon to every 5 cups of food waste you add to the composter. Initially, I had hoped to keep this in my kitchen, beside my trash and recycling bins. They actually make cabinet kits for the composter, but I don’t have an outlet I could plug it into. Also, there is nothing latching the top closed (from curious fingers) and they warn that the inside can get quite hot. The composter can be used in temperatures from 0-120 degrees, as long as it has an outlet that is protected from water while plugged in. I have one of these handy dandy outlets on my covered porch, so I thought I’d put it there. It’s just a few steps from my trash can after all. The dead plants really add to the look, don’t you think? OK, maybe not. I just couldn’t manage to make it not look weird! So, I put it in the garage! Here is a quick video to demonstrate the noise the Nature Mill Composter makes when it is plugged in. I started using it right away. You can put all kinds of food waste in it. The box included easy to reference guides on what you can and can’t put in it. The big no-nos are hard or fibrous items (corn husks, peach pits) and paper or artificial items (plastic, dryer lint, compostable plates etc.) I was worried about keeping track of when to add the sawdust pellets and baking soda, but I didn’t have any trouble. I added some every few days and I had no trash odors at all. Just an earthy smell. I don’t want to gross you out with pictures of icky food waste, but here is a photo of the compost along the process. The black pieces are all that remains of banana peels within hours of adding them. The internal heat, combined with the automatic turning every 4 hours, breaks the material down insanely fast. My videos are very dark, my apologies. The next time I take video in my garage I’ll open the door! This next video shows the composter while it’s turning, so you can hear what it sounds like. Keep in mind that I’m right on top of it during filming, and it’s much quieter if you are just walking by. So, I’ve been using my composter now for about 3 1/2 weeks. It can handle up to 120 lbs of food waste per month, and produces a batch of compost about every two weeks. I haven’t gotten to use any yet, because after you transfer the compost the first time, you let it continue to compost in the lower tray. Next time I’m ready to transfer, I’ll be ready to use some as well! 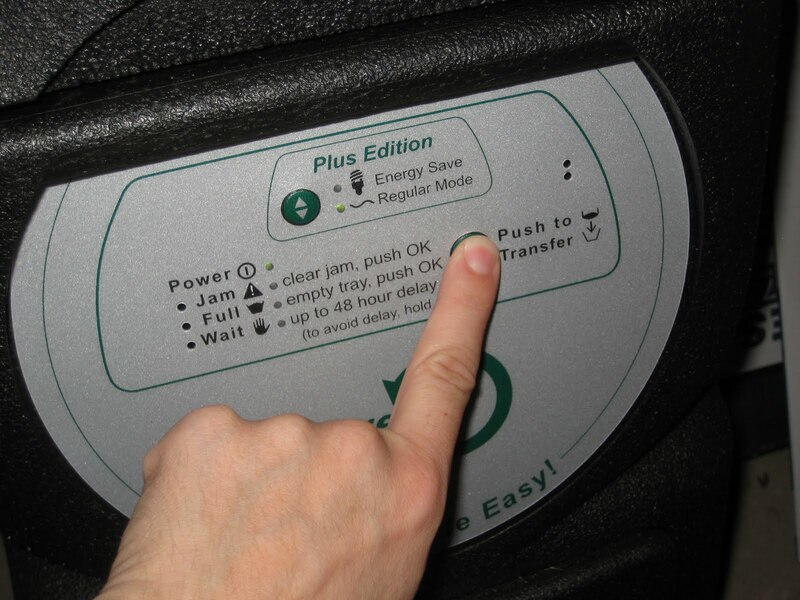 So, transfer…it’s a super easy, 15-minute process that you start by pushing a button. That starts the process of the composter turning the compost, and dropping it through the trap door, to the tray below. Here is another clip toward the end of the transfer cycle. There will be a small bit of compost remaining in the upper chamber after transfer, that’s not a problem, it helps the next batch! You’re left with lovely compost that will continue to break down and compact until your red light comes on! You can see I may have rushed it a little bit since there are still bits of banana peel visible. I was anxious, what can I say! Nature mill also has pricier models with colored accents, foot pedals and lifetime filters. I love a gadget. I do, I can’t help it. It’s all self contained. No piles of food waste on my counter and trekking to the backyard to add it to the pile. No worries about our skunks, raccoons, wild turkeys, deer, cows, groundhogs or bats getting into it. We’ve had animals get a bag from the bottom of our garbage can and spread it all over the yard. No trash smell! My kitchen smells better having all the food waste out of it! It’s fast! No turning by hand and compost is ready in 2 weeks. It’s attractive. It’s about the size of an old school CPU case and is much better looking than a pile of waste outside. You can even put dairy, meat and fish in it! Other things I am probably forgetting right now. We have so much food waste around here between banana peels, other fruit skins, sandwich crusts and all the confetti that signals a toddler is finished with his meal, hee hee. It’s fantastic to not be putting that in the trash! Who knew trash could be “fun? 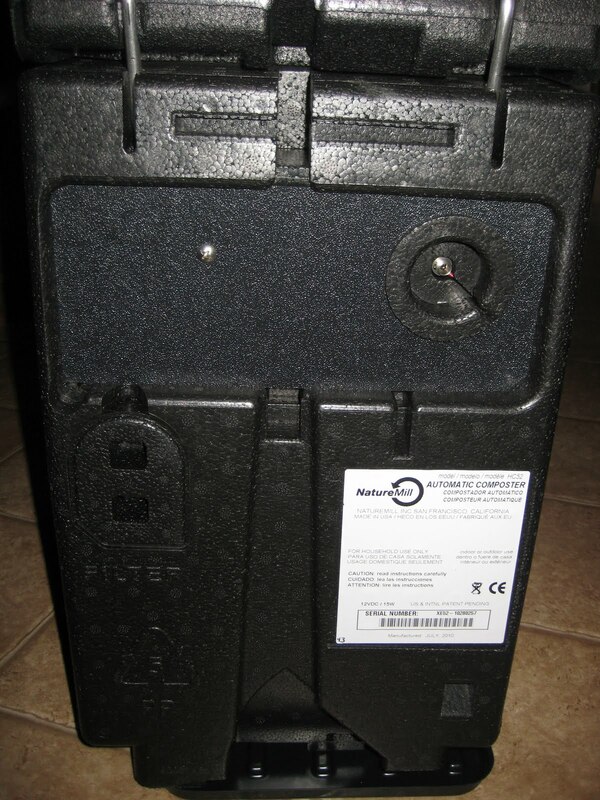 !” There is even more to say about the Nature Mill Automatic Compost Bin, but I don’t want to make this post a mile long! Read more about how it works and “earth facts” on Nature Mill’s website! Thank you to Nature Mill for allowing me to purchase this composter at a discount. The discount in no way affected my review, and all opinions are my own. Thank for the VERY thorough review! I had one of their earlier models many years ago. It worked pretty well but when we moved to our new place it just didn’t make sense to pack it up because we moved to a house with a big yard and we thought we would do composting the old fashioned out-door way. What a mistake that was. A big stink pile outside our nice new home was not a good idea. It’s surprising how difficult it is to turn a big pile once it gets wet and heavy. It is much better to have a machine take care of the mixing. I am glad to see that they have a new and improved model now and it works better than the old one (which was a little quirky and noisy). So now it’s time to start saving up for another one. Oh what color to get? Ha! Yes and big piles of compost will of course attract all manner of critters. Dogs, rats, raccoons, flies, and of course worms (which you want anyway). You don’t have to turn a big pile, you can just let “compost happen” but it helps to turn it periodically and you will get much more granular compost texture without the mold and harmful bacteria if you turn it inside out several times per year. >Hey, I'm glad I'm not the only one who got a "waste collector" for her birthday (and was excited about it). LOL! !